One of my favourite moments from recent fixtures was without doubt the 3-0 in 2006 victory which confirmed the retention of our championship. It wasn’t the stupendous Joe Cole goal or the rampaging third smashed in by Carvalho it was when our then manager approached a stunned Sir Alex a couple of minutes before the end of the game to shake hands. It may have provoked the desire for United to win the following year but it was a great moment and signalled we had arrived. For many years the visit of Manchester United was something special. Certainly before we became title contenders it was a benchmark, how good were we and could we compete. Those days are gone, as we know we can contend and we have won the Premier League more recently than them but the fixture remains a big game. This year, more so because of the returning manager. Many including myself have given thoughts about what the return of the Special One means but there are so many other things happening not least of which is the honouring of Matthew Harding. The club are apparently pulling out the stops and rightly so. His legacy will live forever and I am lucky enough to have sat it the stand named after him and have done so since it opened. I will never forget the night we heard he had lost his life. Our football was just beginning to emerge from the doldrums and we thought we had a decent chance of progressing in the cups. An away tie against Bolton in the league cup should have been winnable, it wasn’t but any angst over the defeat was replaced by the sheer horror and sadness of learning in the morning of Matthew’s death. There was no social media at the time and details were scarce but the outcome was certain. The next home game we played the team from North London that play in white. I cannot stress how respectful their fans were. The mood was sombre, the tributes of flags and flowers plentiful a Guinness on the pitch. A sad day but he was rightly recognised by the club when they named the stand after him. So what of the game? The opposition come into the fixture on the back of a bore draw against Liverpool. Like many times for us Jose set up not to lose and succeeded. His team followed orders and Liverpool didn’t manage to break them down. The irony being without two world class saves by De Gea the game would have been lost but by the same token had Ibra done better they may have won. Again this will be a game Jose will not want to lose but there is a possibility he may want to blitz us at the beginning to really test our back three. He will however be conscious of not giving us too much space and so his line-up will tell us a lot. It will be interesting to see if Mata plays, a firm fan favourite but he has not shone in recent games against us. Like us United are a team in transition some good and some bad. They are not yet where they need to be but unlike Conte, Jose got what was on his shopping list and he has got to prove he is not on the wane. I like several of their players, De Gea is world class and I would have liked Luke Shaw. My personal favourite is Ibra, I was convinced he could have done a job for us but we will never know. As for our line up, I expect us to be unchanged. I read that our players will want to get one over on Jose but I am not sure how true that is. We have no idea what happened last year apart from the fact that the players stopped playing for him. All I want from them is to play for the shirt and the three points. It will be difficult for everyone to separate the Jose factor from the match but we just need to get on with it and as fans support the team. Our last two performances have given me more hope for the future than in recent months. 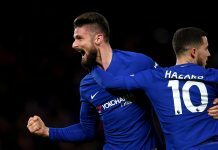 It appears that Conte gave the old guard a chance and after the two shocking displays against Liverpool and Arsenal decided enough was enough. Yes Hull and Leicester were not he strongest opponents but the first 45 minutes against Ranieiri’s side were the best we had played for 18 months in my opinion. The midfield is ticking and Kante superb. The return to form of Matic has been great and there will be an almighty tussle with Pogba. Much has been said about the introduction of our wingbacks and tomorrow will be a test for both particularly Victor Moses. Superb going forward but not really tested at the defensively yet. 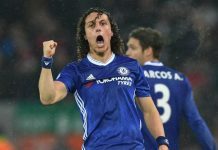 My only concern with the defence was Gary Cahill who needed to be guided by David Luiz in the last game. In everything but the armband Luiz was our captain and he will have a point to prove against Jose. What odds first goal scorer? One thing that will undoubtedly happen is the baiting of Costa. The man himself has been remarkably restrained since getting his fourth booking but tomorrow is game when emotions will run high and I suspect thinks will get feisty! He has looked unstoppable this season in contrast to the forlorn angry striker this time last season. The game tomorrow is important for us. We have beaten all the teams we should have with the unlucky exception of Swansea but were badly beaten by the two better teams we played against. If that should happen against United and personally I don’t think it will, then it will be a setback. We have a tough run of fixtures coming up and without stating the obvious a good result and performance against United would help going into those games. I think tomorrow will be a draw but ultimately I would like the day to be remembered for the football and Matthew Harding. Previous articleReturn of Jose: Trick or treat?